I got to go to India, and Brett got to ride across Australia on the Indian-Pacific. After I took this picture (in Cook) this rail fan headed down to check out the engines. We’ve made it to Sydney! And, we had a fabulous time getting here, on the train ride of a lifetime. Car C, Cabin 4 – we faced forward for two days (to Adelaide), but then backwards for the day and a half into Sydney. After the first two days though I found sitting backwards didn’t bother me as much as I feared.. The bottom sofa folded into a bed, and there was a second bed that dropped down from the upper cabinet. The East Perth train station was just a 10-minute walk from our Airbnb condo, and as we headed for the station with all our luggage at around 8:00 a.m. last Sunday morning the walk was thankfully nice and cool. Great Southern Rail’s legendary service and hospitality began the minute we arrived at the station – our big suitcases were collected and we were given our cabin assignment: Car C, near the front of the train, Cabin 4. I asked if it was a forward or rear facing cabin, but no one seemed to know so we continued to keep our fingers crossed until we could board and find out. Coming out of Perth we rolled through lush farmland for most of the day. Our second day started out in the famous Australian outback. We saw LOTS of kangaroos, and also emus, camels and the BIGGEST hawks I have ever seen, larger than an American bald eagle. 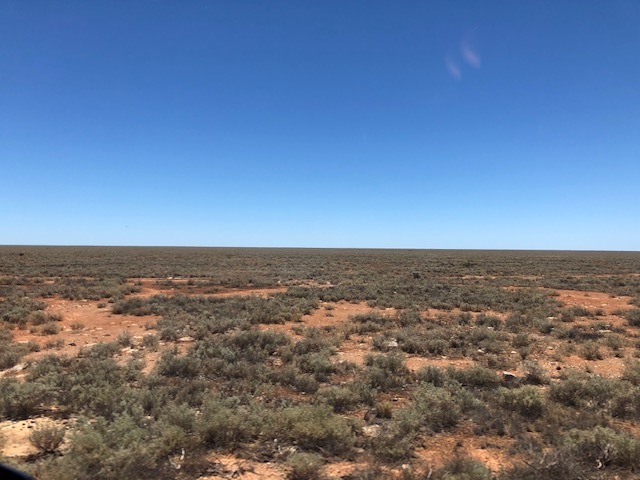 And then we reached the Nullabor – empty as all get out, and not a tree or animal in sight for over 24 hours. We boarded the train about a half-hour before its scheduled departure time of 10:00 a.m., settled in to our front-facing cabin (yeah!) and before we knew it the train was rolling out of the station. We had been given an itinerary for the trip at check-in, but shortly after we departed we were visited by our car manager in order to choose our off-train outings, and a short while later by the restaurant manager in order to receive our restaurant schedule. Car C was just two cars away from the lounge car, and three away from the restaurant. 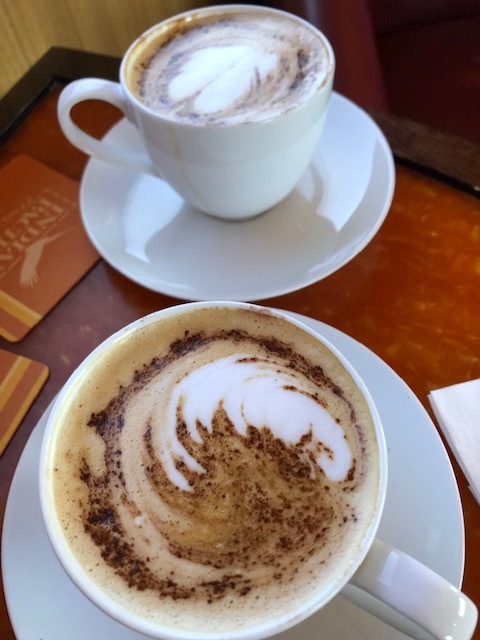 Cappucchinos were one of our favorite beverages to enjoy in the lounge car. Our time onboard the train was very relaxed. We spent most of our time in our cabin, looking out the window at the scenery or napping, but we sometimes headed down to the lounge car to meet other passengers, to enjoy a drink and/or a tasty snack, or have a cocktail before dinner. All meals and drinks on our trip were included in the price of the ticket – all we had to do was order and enjoy. We turned out to be the only Americans onboard! Most of the passengers were from Great Britain (several of whom were continuing on with a two week cruise around New Zealand), but there were some Australians, and we also met a couple from Ireland, a very nice man from Japan, and a there were few passengers from India and South Africa. My favorite experience of the trip happened the first evening as we were getting back on the bus to go back to the train after a late-night off-train outing. We were looking for our seats on the bus, and a woman from Britain piped up, “Oh, you’re behind us. I recognize your accents.” What!?!?!?!? We don’t have accents!” was my first thought. It took me a second to realize that this time around we were the odd ones out, and the ones with an accent to everyone else. Although we usually always sat with another couple for lunch or dinner, for breakfast Brett and I were given this cozy table to ourselves a couple of times. One other thing about the passengers (us included) is that I don’t think there were more than 10 people on that train less than 60 years old! Even though we’re both in the second half of that decade, Brett and I still felt like spring chickens compared to many of the other passengers – most, we guessed, were in their 70s – but everyone was friendly and we had a good time with everyone we interacted with. The dining room did a good job of seating us with different people and we enjoyed chatting with and hearing about others’ lives and experiences, where they were from, and so forth. Our beds were always made up while we were at dinner, and put away during breakfast the next morning. Brett slept in the upper bunk, but both of us rock and rolled all night with the train as we slept, especially the second and third nights – they were pretty wild! Probably the best thing was that we had a private bathroom with a shower. It was so nice not having to walk down the passageway to get to the bathroom, especially in the middle of the night. The only negative we experienced during the entire journey was that a jar of (expensive) moisturizer, a Christmas gift from Brett, went missing the last night – we don’t know if someone from the cabin crew took it when they came in to prepare the cabin for nighttime, or it fell and broke and they threw it away. Whatever, it was missing this morning and nowhere to be found, and will have to be replaced while we’re here in Sydney (if I can). The meals we were served were nothing short of extraordinary. The menu was different every day and showcased local Australian food products. We were afraid we were going to see kangaroo appear on menu, but thankfully it never did – Brett said he would have tried it (camel masala was one of the lunch choices one day, but we chose something else). 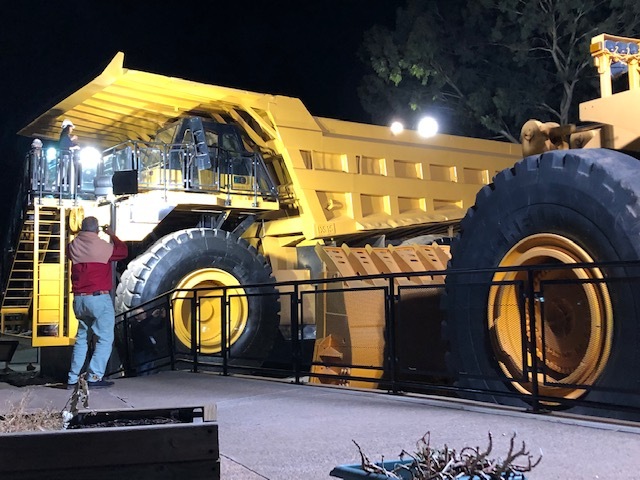 – Day 1: The Kalgoorlie gold mine tour. We got into Kalgoorlie after 8:00 p.m. so this tour took place at night and it was difficult to take pictures. We visited the Super Pit, where miners dig around the clock. This place was massive and DEEP, and from there we went to a visitors center where we watched a cute skit about how gold was discovered in Australia. The Super Pit was expected to close back in the 1980s, but they are still finding fresh veins of gold, and now they expect it to stay open another 30 years! I did not think I would enjoy this tour very much, but I learned a lot and in the end was glad I went. For example, I learned that only 7% of the gold mined in the world goes to make jewelry. That figure surprised me, but most gold mined these days goes into phones, computers and other tech devices – they wouldn’t operate without gold. It was too dark at night to get pictures when we visited the mines, but we did get to see a couple of monster hauling trucks up close. The trucks cost over 4 million US$ each, and have to be replaced every seven years because they wear out! The tires are as big as a swimming pool. 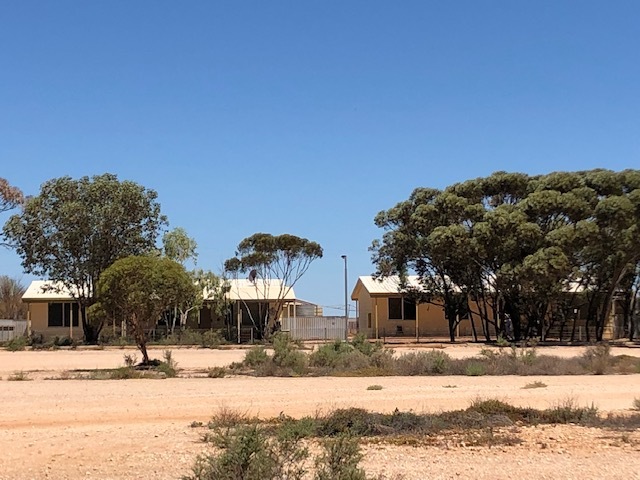 – Day 2: We skipped the morning stop at a sheep ranch and slept in, but in the afternoon got off to stretch our legs at Cook, a ghost town out in the middle of the Nullabor Desert, located on the longest straight stretch of railway track in the world. 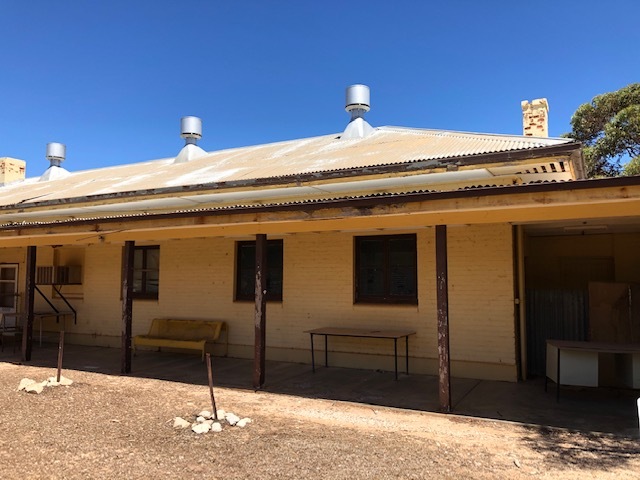 Cook was founded in 1917 as a primary place of support for the railroad in the Nullabor, and over 400 people used to live there – it had its own school and hospital, and the town got all its water from an underground Artesian aquifer. In 1997 the railroad was privatized and said it no longer needed full-time support from Cook, and the town dried up literally overnight. Today only four people live there to help refuel the Indian-Pacific when it comes through twice a week. Deserted housing in Cook. I cannot begin to describe how hot it was here – people in Arizona in the middle of the summer might have an idea, except there are no monsoon rains here. The former hospital in Cook. Everything was left behind when people left. 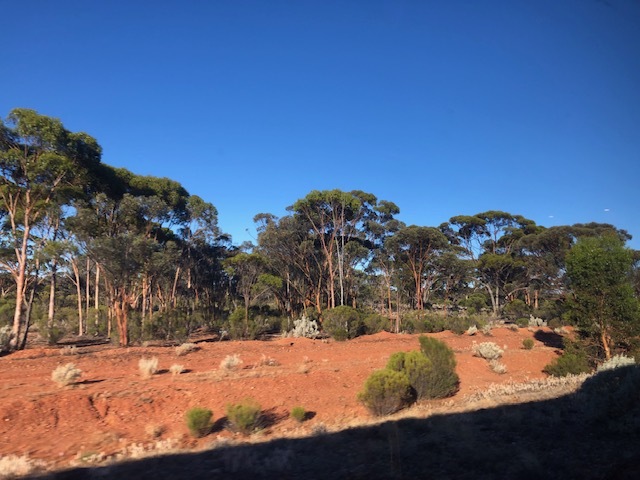 – Day 3: We arrived in the South Australian city of Adelaide early in the morning, and had a choice of four different outings. Brett and I took walking tour around the center of Adelaide, where the city was founded. It was a short but interesting tour and we had a charming guide. Following all the tours train passengers were served breakfast in a downtown convention center while the train was repositioned and new staff came on board for the trip to Sydney. In the early evening, the train stopped in Broken Hill for refueling and to drop off mail. Broken Hill is an old mining town and was the setting for The Adventures of Priscilla, Queen of the Desert, a comedy drama about two drag queens who travel around Australia in a bus called Priscilla. Along with most of the passengers, we chose to see the “Main Drag” and had a fun time along with everyone else. Our evening included complementary wine and spring rolls, but finished early because one of the performers was not there that evening. The extra time allowed us to take a leisurely stroll through town on our way back to the train. Sunrise as we arrived in Adelaide. 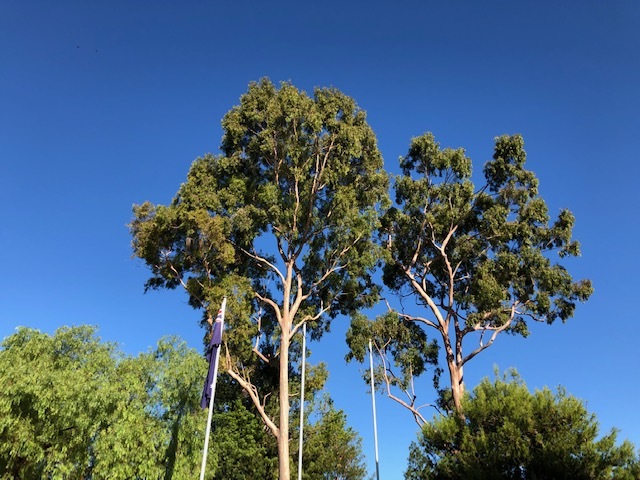 Eucalyptus trees tower into the bluest skies I have ever seen! There are over 700 varieties of eucalyptus in Australia. 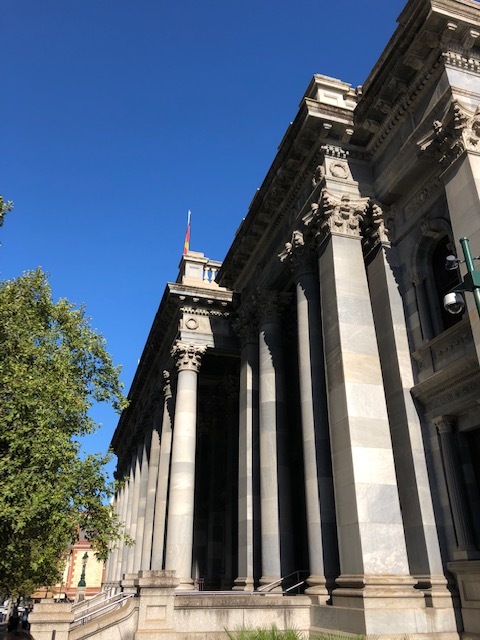 The South Australia parliament in Adelaide took 65 years to complete! There are supposed to be additional towers on the ends and in the middle, but they gave up and no one is interested in adding them now. 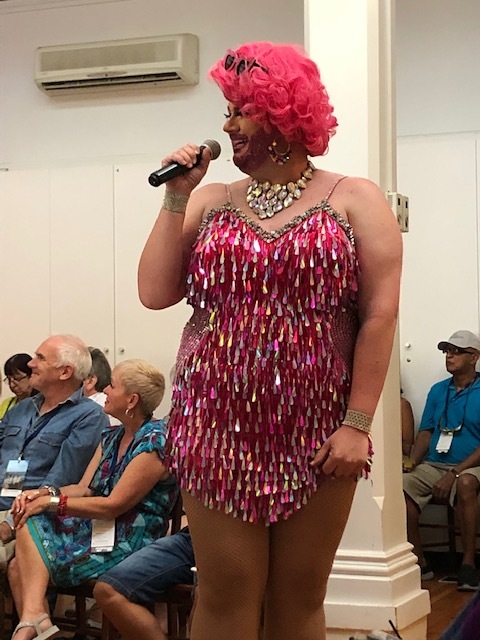 The drag show in Broken Hill took place in the historic Palace Hotel. 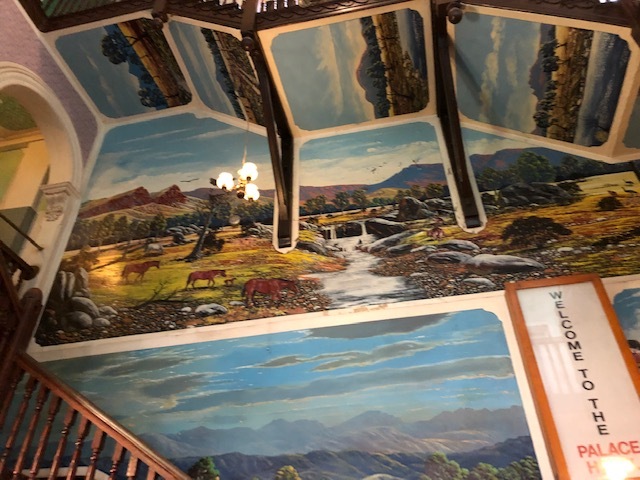 The walls of the hotel are covered in hand-painted murals with scenes of Australia. This guy was fantastic and funny. He was spangly from head to toe, performed in 5-inch heels, and even his beard was glittered. 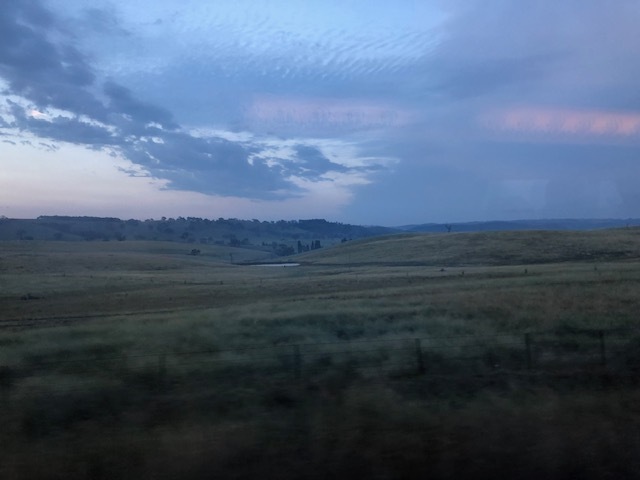 – Day 4: The last day on the train and it stopped in the gorgeous Blue Mountains National Park. We signed up for a 1-hour hike with guides who took us to some out-of-the-way spots along with the more famous sites like the Three Sisters and the Orphan Rock. The “blue” in the name comes from the haze caused by eucalyptus trees, similar to the haze in the Great Smoky Mountains. The temperature up in the mountains was lovely and cool, and after two days of desert we were happy to see all the green trees and water. 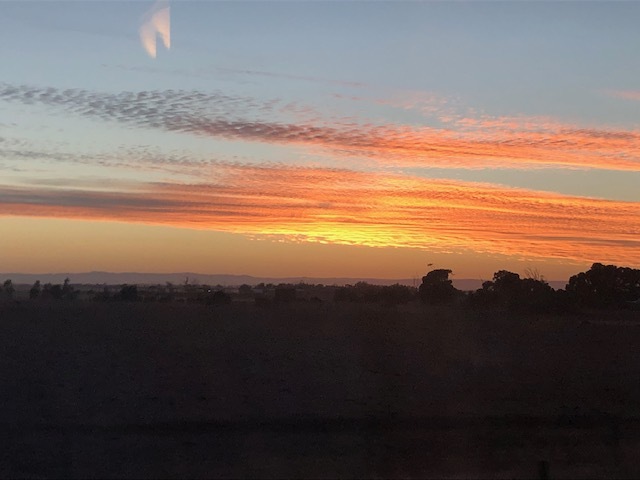 After two days of rolling through the desert, we woke up to this beautiful scene of rolling farmland on our last morning on board the Indian-Pacific. We (and apparently everyone else) were glad to get off the train when we arrived in Sydney – four days and three nights were enough. But, it was the journey of a lifetime for us, especially for Brett, and I am so happy that we were able to include it in our itinerary. 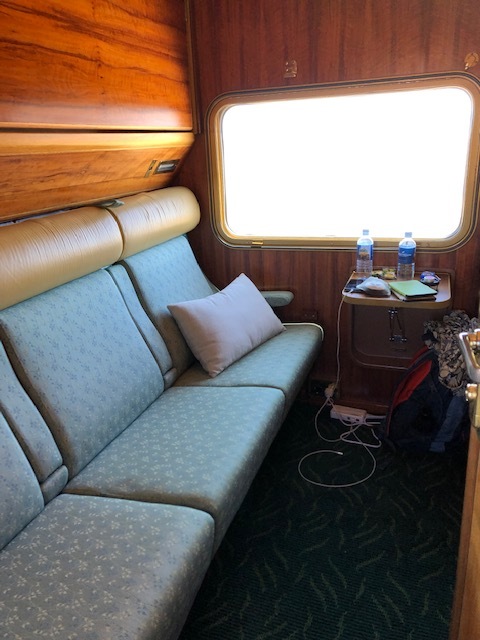 Great Southern Rail offers three different trips through Australia, all with comparable service to the Indian-Pacific, and both Brett and I said if we ever make it back to Australia we’d love to ride the others, especially the Ghan, which runs from Adelaide to Darwin in the north. Welcome to my city!!! 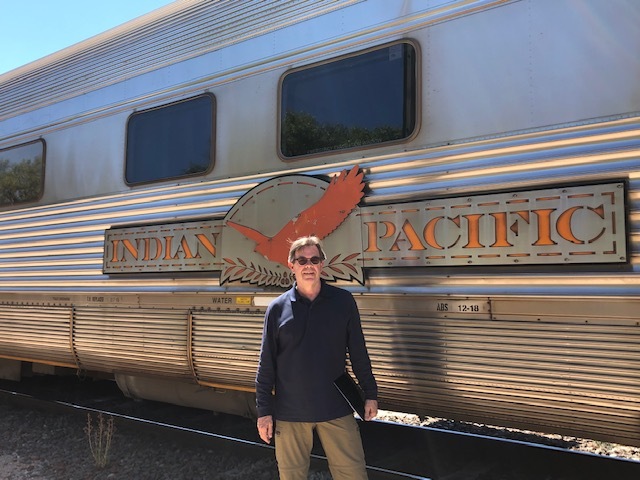 I’ve always wanted to do the Indian Pacific but like a lot of Australians, I will wait until I am in my 60s or 70s – when I no longer can do long haul flights around the world. Dar from An Exacting Life very recently suggested I read your blog, so I’ve started from the beginning. I’m still in 2016. So if you’ve looked at your stats and wondered who’s been reading that far back – ME! Now if only I’d been introduced to your blog earlier, I could have invited you to stay in my home. Well, we love it here in Sydney so far although our adventure won’t really begin until tomorrow. We’re staying in a very sweet apartment in the Potts Points neighborhood, although there’s no A/C so after the cool train we’re having to readjust our body thermostats. My brother lives in Queensland (has been there for over 40 years), but he flew down to Sydney this evening and we’re going to spend a few days together here – I haven’t seen him since 2005. I’m sad we couldn’t get up to Queensland, but just could not make it fit either time- or money-wise. Anyway, I hope the temperature won’t be too bad here and we can get out and do a few things. Tomorrow is supposed to be HOT though so I’m thinking we may be out on the water for a good part of the day (on the ferries, of course!). Would love to do a meet-up if possible here if we can work it out. Let me know if you’d like to get together for a coffee, and if so, we’ll try and work something out – we leave for New Zealand on February 6. Lovely that you can catch up with your brother. 40 years! He must be very Aussie!?! Would love to meet up. I work full time but if you are free on Sunday I can take you for a drink to my favourite pub in The Rocks. My brother has a pretty thick accent, but the more we’ve talked today the more it’s disappeared. He’s definitely more Australian now than American though. I will send an email tomorrow – we’d love to meet up on Sunday! If you’d like to catch up, drop me an email at sans_lucinda@yahoo.com.au Then I can email my phone number. Sunday would be a great day for me to meet-up. I will send you an email tomorrow! We went over to the Rocks today, but it was just too hot so we weren’t there very long, but at least we know where it is and how to get there now. What a wonderful write up, Laura! And you are now in one of my favorite cities in the entire world. Sydney is truly the jewel of jewels! I hope you and Brett are able to visit the National Maritime Museum in Dahling Harbor. He will likely love chatting with the docents, all retired navy. Oh, and be sure not to miss the fox bats, and the evening bat flight, from the Royal Sydney Botanic Park. Biggest bats we’ve ever seen! We’re having a good time so far – just got back from a delicious seafood dinner at a restaurant nearby our Airbnb. I’m having a great time catching up with my brother too. Today was just too hot to do much of anything, but being out on the harbor helped. We took the slow ferries over and back to Manly beach and got some terrific views along the way. Tomorrow we tour the opera house and will check out a couple of extra places (and stay in the park to see the bats – my brother said they were actually considered pests but they can’t get rid them). Was out looking to replace the moisturizer that went missing from our bathroom on the train (grrrrr) and tripped and fell going into a big department store . . . and most likely broke a toe. I can still walk but it’s a bit painful (still walked nearly 16,000 steps today). We stopped at a pharmacy this evening and bought tape because that’s all they’d do at a clinic: X-ray my foot, tell me my toe is broken, and then tape it up. But it’s still sort of a disappointing thing to happen right now, and it hurts. Oh that train ride sounds wonderful! I want to be on the Trans-Siberian one day but that is not in the foreseeable future yet. Enjoy your adventure! 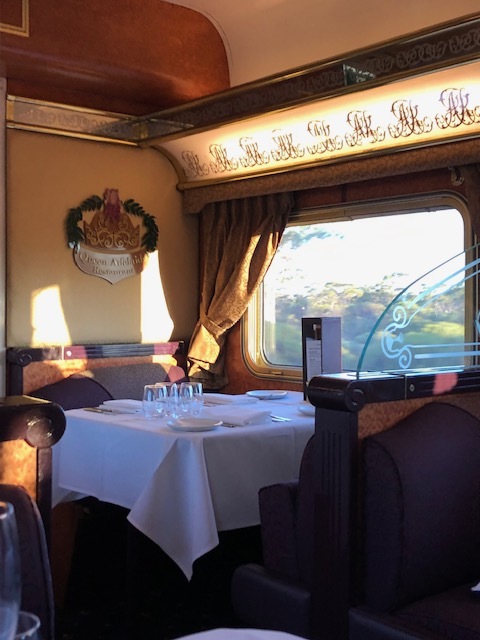 The Trans-Siberian is another one of those fabulous cross-continental train trips – I wonder if the service is as wonderful as it was on the Indian Pacific? Our ride was comparable in many ways to staying at a posh hotel, other than the small cabin. But, I am so glad we did it – we had a wonderful time and saw things and did things we would have never done otherwise. It was worth every penny we spent. LOVED this post! Felt like I was along on the adventure with you. Visiting Australia is high on my list as well. We’re having a great time in Australia, and Sydney is beautiful (although I tripped and fell today and most likely broke my toe 😦 ), but I can’t say yet that I’ve fallen in love with it yet. I wish it wasn’t so far away so we could get here more often. What a wonderful post!! You sure are seeing some beautiful sights. The train trip was a lot of fun and we met some very nice people. But four days and three nights were definitely enough! We’re happy to be in Sydney – the weather reminds us of Hawaii, although it’s much hotter here than it ever got there – and we’re looking forward to New Zealand. I’m getting excited about being in Japan again, not just because I get to see our son and family, but because we can unpack for awhile and live a somewhat normal life instead of out of a suitcase. What an exciting adventure! Some of the photos of the mountains remind me of Waimea Canyon. Thank you for sharing this with us. Enjoy! I went back and looked at those photos again, and there is a resemblance in some ways to Waimea Canyon. I didn’t see it at the time though. The humidity here sure reminds me of Hawaii though! Perth was very dry, so even when it got hot it was comfortable, but it was miserable here today with the high temps and high humidity. Tomorrow is supposed to cool way off though, thank goodness. I always loved riding across country on Amtrak so I am delighted you got to go across Australia! Gorgeous pictures! We had a great time, and were very spoiled. We were more than ready to get off the train when we arrived in Sydney though, but a couple of days later now we are talking about when we can do another! Great pictures. Sorry about your toe. So glad you get to see your brother. Maybe Queensland can be one of your future 1 to 3 months stays. Breaking my toe was a downer, but thankfully it wasn’t worse. I am definitely a klutz though. Having a great time seeing my brother, and would love to go up north and see him and his wife some day. There’s a train trip from the south to the north of Australia that would put us close to where they live . . . hmmm. 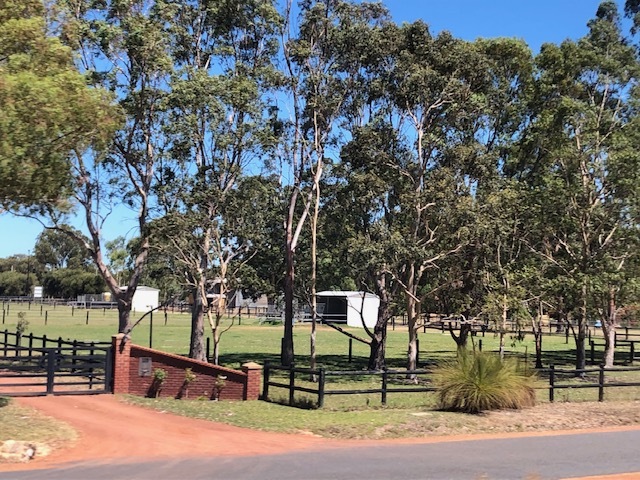 We are finding Australia very affordable, especially compared to Hong Kong, so it would be a good location for a longer stay, even more so because there is no problem with the language here. Well, I haven’t even crossed Canada by Via Rail, so Australia seems like a distant dream. But I will get there eventually! There is more greenery than I would have expected. I guess it adapts to the heat! The train ride was a terrific experience, but the one across Canada would be the ultimate experience for us! We’re hoping to do it some day, if possible. The vegetation here has been interesting – most of what we see reminds me of what I grew up with in Southern California, or more recently, of plants we saw on Hawai’i. What an experience on your train ride!!! I just can’t over that beet tortellini!!! The food was AMAZING! Brett was hoping the tortellini would show up on the menu again but it never did. It was very, very good. The train’s kitchen was tiny with three people cooking, and the ride bumpy, and yet they kept turning out those amazing, flawless meals!